The years leading up to the Second World War saw the design and development of a wide variety of aircraft. Many went on to fame and distinction during the conflict and of those we have a great deal of information, but there were many others of which we know little and the Dornier Do 22 is certainly one of those. Developed for Yugoslavia by Dornier-Werke Gmbh, only 29 were ever built and it was not adopted by the Luftwaffe making it less than a success for the company. However, it served with distinction with the air forces of the Kingdom of Yugoslavia, Kingdom of Greece and Finland. This obscurity has meant that it has not received the attention it deserves and no publication has covered its entire history – until now. The book begins with a brief biography of Claude Dornier and his career leading up to and including the establishing of Dornier-Werke and the trials and tribulations of keeping the company solvent during the turbulent inter-war years. Much experimentation was conducted and the book covers the predecessors to the Do 22 and its protracted prototype development. There follows a lengthy section on the production of the float and land plane versions including schematics, technical drawings, specification charts and pictures of close-up detail and factory photos. There are also step-by-step instructions on starting the engine, take off and landing procedures and maintenance routines. I have no doubt that with the right tools and a big enough garage, you could build it yourself! 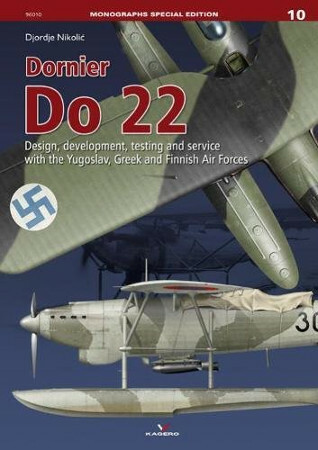 The book then covers the Do 22's service with Yugoslavia, Greece and Finland and describes in detail the missions and exploits of the crews. This is followed by sections on camouflage and markings for each country. There is an extensive appendix listing a plethora of additional information and a selected bibliography listing books, internet sources, archives and personal collections. It's hard to imagine a subject more thoroughly researched. The last 32 pages comprise of 3-view drawings of both sea and land planes in 1/72 and 1/48 scale, followed by beautifully rendered color illustrations of the planes in Yugoslavian, Latvian, German, Greek and Finish markings. Lastly, this special edition includes two folded inserts (23" x 16.5") of drawings in 1/32 and 1/24 scale (at that scale, it barely fits on the page). In conclusion, this book is well written, well researched with multiple pictures and illustrations on every page. If you are at all interested in unusual aircraft with interesting histories and small air forces with colorful markings, this is a book for you.